Woke up around 8 and Ignacio and I had fresh fruit for breakfast. Afterwards I met up with most of the other students and we went to the Bazaar Sabado. There were lots of paintings and other artsy-type things in the market. Then we visited the houses of Frieda and Trotsky. We did a good bit of walking, but the bazaar especially was absolutely gorgeous. After Trotsky’s house, a portion of the group went home and the rest of us went to El Centro for lunch. 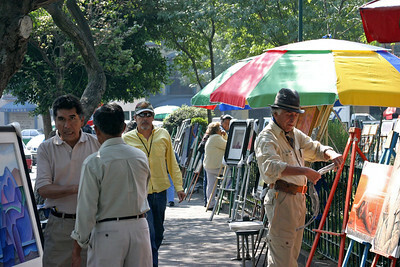 EL Centro is a large square with vendors, café’s, street performers, etc. I took a small nap when I got home and then Karolina and Ignacio made chicken with mole for dinner. After that we went to the Hardrock café to meet some of the other AIU students. There was a wedding this afternoon which they were celebrating in addition to graduation.